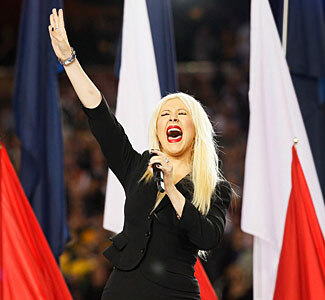 Diva Devotee: Duelling Divas: "Star Spangled Banner" Sing off!! Duelling Divas: "Star Spangled Banner" Sing off!! Our American friends should be out celebrating and enjoying themselves, but we'll mark the day here at DivaDevotee with a tribute to the American National anthem, the Star Spangled Banner- an anthem that is renowned for its difficulty due to the octave and half range it calls for but that's something that shouldn't be no problem for our Divas! Below is a compilation of various Divas putting their own twist on every patriot's favourite song. If you manage to get through them all please vote below as to which was your favourite rendition! Happy Fourth of July! psst, if you know of any other holiday/s a country celebrates coming up, and can think of a good way for me to honour it via a Diva related post, please email me at divadevotee@gmail.com! Aaliyah: A somewhat shy and slightly awkward performance, which is understandable considering her being a teenager during this performance. She still managed to hit all the high and low notes though, and demonstrate- in parts- why the tone of her mid- to low range was second to none. Christina Aguilera: Yes, I've spared her- and you- from that notorious performance where she forgot the words, and also the terrible improv-like performance where she sang accompanied only by drums. The version below has Christina at her most restrained, with the embellishment kept to a minimum- by Christiana standards anyway- and not venturing into her head voice to hit any notes. The whole performance is 100% live, and even more impressively totally a capella. Beyonce: A version that has a beautiful orchestral arrangement that adds greatly to the tension of the piece. Beyonce really heats up when it comes to the climax of the anthem and her world class vibrato and trademark runs add a spine tingling magic to the ending of the performance. Mary J Blige: Mary's voice adapts brilliantly to the anthem. Her voice is strong and grounded throughout the beginning with no shaky notes to be found on the low or midrange notes. Slight problems creep in on the top chest notes though, but overall its a great performance that shows Mary's voice can adapt to anything that's thrown at it. Brandy: Unsurprising for an alto like Brandy she shines on the lower parts of the song, the tone isn't as silky as usual but that's a small complaint. The higher chest notes sound slightly forced, but this is a live performance with no instrumentation to support her, so its understandable that nerves may induce a tighter throat and effect the larynx. Toni Braxton: Another performance with no backing and done entirely live. Timing is a little off at times but Toni keeps pretty true to the melody, giving a solid performance. Mariah Carey: it has to be said this is rumoured to be a pre-recorded vocal, evidenced by near enough exact renditions at different venues, but boy oh boy did Mariah Carey make it her own. Low notes, high notes, whispered notes, whistle notes (a B6), sustained notes all delivered as turned out and polished as Carey herself was. Not being an American and not having the emotional connection to the anthem, this is the vocal that I liked the best, it's also the one that gave me goosebumps. Cher: I seem to keep underestimating Cher, but here she delivers a surprisingly good, albeit pre-recorded, rendition. Her thick, voice and quick vibrato sound entirely suited to the anthem, adding to the drama of the piece. The ending was particularly breathtaking, with the build up on the repeated lyric of "the brave" and the sustained Bb5 being a brilliant way to finish. Charice: An unbelievably accomplished and confident performance for any singer let alone one who was only 16 at the time. A strong vocal delivery from low, middle to high, with the tone being kept constant and pleasant throughout. It's no wonder she has enjoyed the success she has. Kelly Clarkson: Kelly just screams out the phrase "all American girl" to me, and as such seems made to sing the anthem. The performance was simple, on point, not too fancy or fussy, and crucially allowed the lyrics and the melody to do their job. For an American this is probably what they'd like to hear, as it feels respectful to the original composition, but for someone who doesn't have the afore mentioned emotional connection to the anthem, this rendition just felt a little boring. Keyshia Cole: Her performance had a few off notes and the vocal arrangement- held notes being placed in odd locations, dodgy melisma and awkward runs- messed with the build up and climax of the anthem, ultimately leaving it feeling deflated at the end. Not one of my favourites. Aretha Franklin: Its Aretha, and I respect all she's done, but this is just terrible... I actually laughed out loud listening to this...sorry Aretha. Jennifer Hudson: Hudson is as capable as ever on her rendition of the anthem. Her vibrato stops the vocals from sounding like shouting, the runs aren't offensive and the E5 at the end is glorious, but I still somehow come away from it feeling a little underwhelmed. I wish she would experiment more with the dynamics and texture of her voice. Whitney Houston: Considered the seminal performance of the Star spangled Banner by many- which it must be noted was said to have been pre-recorded. This performance oozes patriotism; its strong, stoic and unflinching. Beautiful use of different vocal colour and texture heard best at the build-up as her voice fluctuates from being soft, warm and airy to full, solid and powerful. Vocal genius at work. Faith Hill: This version really heats up with the climax, as Faith Hill's chest voice soars gracefully over the top notes with ease and aplomb. The voice sounds a little sharp in texture, and the runs a little misplaced but those are only minor quibbles! Fantasia: Her voice never wavered and despite me fearing that it would crack as she went higher and higher up her chest register it remained intact and full of power. JoJo: Her timing was changeable, slowing and speeding up at will, but as a whole this was a performance that impressed me most because of the solid, pleasant tone of her voice. Once again another performance sang to a high standard by a teenager! Chakka Khan: There is a lot of echo going on in this video, and quite a few bum notes and deviations from the melody, but it's not anywhere near the terrible state of the Aretha rendition. Monica: Her dark, thick timbre doesn't apply well to the singing of the anthem and feels like it's struggling with the top notes. The voice has a dramatic feel that is impressive on the belt, but as a whole it sounds like its out of Monica's range- despite her recording voice seeming to suggest otherwise. Patti Labelle: Just like fellow Queen Divas Areath and Chaka, Patti sings the song how she wants to. Perhaps they have paid their dues and earned the right to do so, but the melody is there for a reason. Love you Patti, but this is not pleasant...in fact I think I need a paracetamol. Demi Lovato: She was hitting the notes, but the high notes were starting to tip over into shouting...Note:I think I'm loosing the will to live and I'm only about half way through these. LeAnn Rimes: Her country twang suited the anthem very well and her rendition was composed, and assured, demonstrating her knowledge of her own voice brilliant by her not pushing it unduly. Kelly Rowland: Her voice is strong and resilient throughout the low, mid and high parts but the arrangement felt flat to me. There's no doubt if she was backed by an orchestra and tampered with the arrangement a little that her version could be as strong as her Destinys child counterpart, Beyonce. Jessica Simpson: Struggled a little on the lower notes and as usual with Ms Simpson the high notes were pushed and forced. Like the others who sang live and a cappella I have to give credit for that, but this was too painfully sharp and piercing for my now battered ears to take. Jordan Sparks: I really liked the texture of the voice in this rendition, warm, breathy , controlled and- perhaps because I've listened to these all one after the other- I am thankful it wasn't as strained, or loud, as some of the others. Taylor Swift: Bless Taylor, she's a great songwriter and her voice suits her music, but she was never going to be able to sing the anthem like it was originally written. However, kudos to her for writing her own little rendition that, for the most part, stayed sounding comfortable and true to the original. Destinys Child: This rendition was brought to my attention by a comment in the chatbox, and as their comments regarding it are pretty spot on I thought I'd use them. KarenV writes, "I love how they nail the harmonies on this, and I think the key change on 'brave' is lush." Amber Riley (and the Glee cast members on backing): A patriotic arrangement of the anthem, with Amber Riley delivering a strong vocal that was sympathetic to it. Her voice really excelled on the top, chest notes- a place her voice tends to most impress at- and the midrange held note at the end was a nice way to finish. I loved Amber Riley's version of the Star Spangled Banner at the World Series. Although the Glee cast added to the greatness of the performance with the harmonies, Amber really killed it. I love this comparison and your commentary. I think you should include Donna Summer's version or at least take a look at it. Thank you. Mariah! Defo, Kelly Clarkson a close second! I am not American either but felt that theirs was both the most innovative and traditional respectively! And by Kelly's version I mean this one.. I know she's British but I'd love to hear Leona Lewis do it just for the sake of comparison. As an American I personally believe this song sounds the best with its original arrangement. I usually don't mind artists personal interpretations of songs however this one doesn't get changed in a clean way. It may be the arrangement of the song itself but whenever an artist completely remasters the vocals it doesn't truly sound brilliant. The best in my opinion was Whitney's because although she did embellish the song it remained true to its original form and her power and moving vocals truly reached the hearts of all Americans. I will give Mariah mercy because although she remastered the hell out of this song she still made it sound like it was suppose to be sung that way with all of that power and range. I don't truly like any of the other performances of this song. I would like to point out however that Zooey Deschanel has done a wondrous performance of this anthem live that sounds surprisingly great for a person known as an actress rather than a vocalist. Really! Why including that Whitney-wannabe called Charice? She ain't even American, why is she singing the anthem of my country? I love Whitney version the best, and I like the national anthem sung by actual citizens the best. That was indeed Celine, because there is a video snippet of it on youtube. This was, I believe, before she lost her voice early in her career and had to rest and regain it back.